The Acumatica Financial Management Suite includes a core set of applications designed for companies with complex requirements, yet are easy to use in smaller organizations. The modules are integrated with each other and also with the other Acumatica suites. Access 100% of your financial information from anywhere using any popular web browser. Improve decisions by using drill down reports and dashboards to gain access to past information and provide insights into future needs. 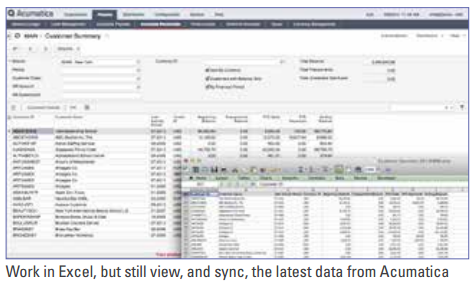 Enter data quickly and reduce errors in the General Ledger using the journal voucher screen, which allows entry of multiple submodules documents at the same time. Acumatica’s standard financial reports provide year over year comparison and budget versus actuals. Prepare financial statements in both your local currency and a foreign currency for reporting purposes. For more information, contact us or download the Financial Management Suite PDF spec sheet.